You are here: Home / About Farming & Food / Why Do Farmers Keep Animals Inside? 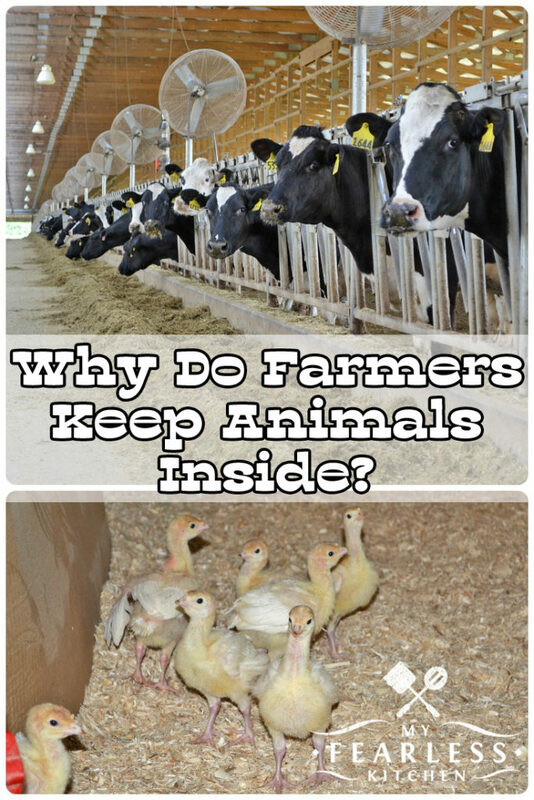 Why Do Farmers Keep Animals Inside? I am often asked why farm animals are kept inside. 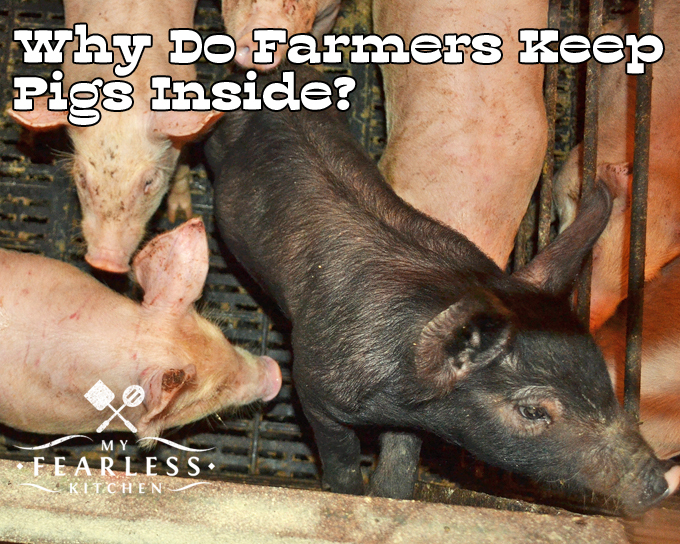 There are many reasons why farmers keep their animals inside, and it’s not for the farmer’s convenience! Why Are Farm Animals Kept Inside? It’s true that farm animals – like cows, pigs, turkeys, and chickens – can live outside. They can also live comfortably inside! One of the big reasons that farmers keep their animals inside is to protect them from the environment. Can you imagine a turkey trying to find enough food in a foot of snow? Or a pig trying to keep cool when it’s over 100 degrees with a heat index of 110 outside? It can be done, but it is very difficult. By keeping farm animals in barns, farmers can control the temperature inside to keep them comfortable all year long. Another major reason to keep farm animals inside is to protect them from predators. All farm animals are prey animals. Other animals like hawks, eagles, coyotes, wolves, and even mountain lions, to name a few, would be happy to come across a chicken or a baby pig left unattended outside. Fences won’t keep these guys away! Disease prevention is another reason farm animals are kept in barns. While farm animals don’t get the same diseases that we get, there are still plenty of things that can make them sick. The Avian Influenza outbreaks in 2015 and 2016 were bad enough with most of the chickens and turkeys kept inside. If these animals lived outside, they could have easily been exposed to wild birds carrying the virus. While Avian Influenza was not dangerous for most wild birds, it was fatal to chickens and turkeys. In the 2015 outbreak, over 45 million birds were lost to the disease. In the 2016 outbreak, over 400,000 birds were lost in Indiana alone. Avian flu is only one of the diseases farmers worry about. Keeping livestock in barns with limited access helps save the animals from getting sick. 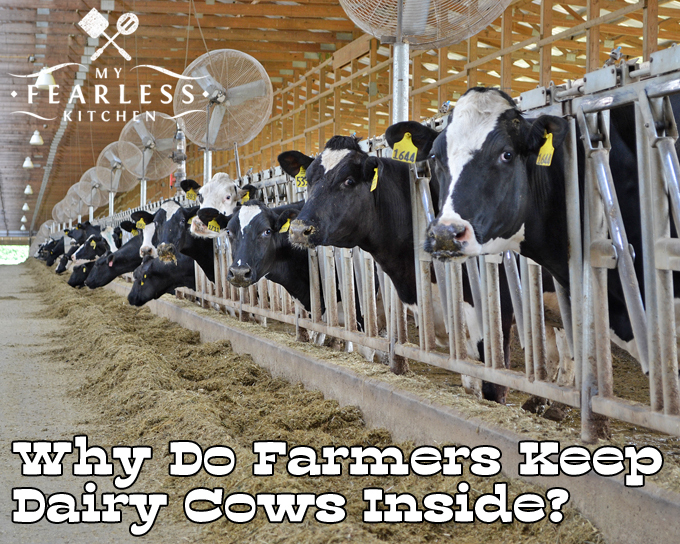 Why Are Dairy Cows Kept Inside? Dairy cows need to eat. A lot. Their job is to make milk. If you’re a mom who has ever breastfed a child, you know how much energy that takes! Keeping dairy cows in a barn means they have easy access to all the food and water they need. The cows don’t have to spend a lot of energy looking for food or water, or traveling between food sources. Since cows can’t sweat, keeping them in a barn also means farmers can keep them comfortable during the summer. Dairy barns use curtain ventilation, fans, and misters to keep their cows cool; even on the hottest days. Most people would rather spend their days inside a cool dairy barn instead of outside in the hot sun! You can read more about how my friend Brian keeps his dairy cows cool in the summer and warm in the winter in this article. 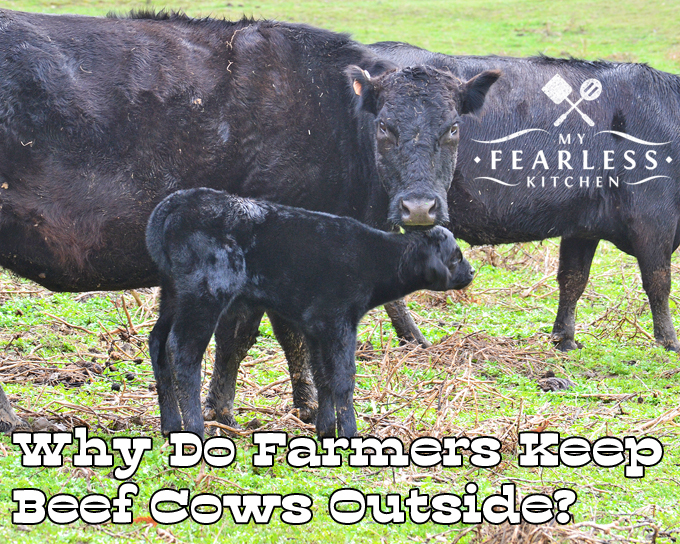 Why Are Beef Cows Kept Outside? If dairy cows are kept inside, why are beef cows kept outside? I know, it doesn’t seem to make much sense. Dairy cows are bred to be tall and thin, have thinner hair coats, and make a lot of milk. Beef cows are bred to be stocky and muscular, grow thick hair coats, and make a lot of muscle and fat. These differences mean beef cows are better suited to live outside than dairy cows. There is also the matter of feed. As I mentioned, dairy cows need to eat a lot to get all the calories they need to make milk. Beef cows don’t need quite as many calories. Dairy cows are fed a mixture of different kinds of feed (read more about what dairy cows eat here), while beef cows eat mainly grass and hay (read more about what beef cows eat here). There is still the matter of keeping the cows cool during the heat of the summer, and warm during the cold winter months. As long as they have somewhere to get out of the sun, and out of the wind and rain they can be safe and comfortable. Find out more about how we keep our cows cool in the summer and warm in the winter. Why Are Pigs Kept Inside? For pigs, temperature control is very important. Like cows, pigs don’t sweat, so they need to be kept cool during the summer. Also, they don’t have hair coats, just fine, light-colored hairs sprinkled over their bodies, so they can get sunburnt! They can also get very cold in the winter – again because they don’t have a thick coat to keep them warm. By keeping pigs in barns, separated by age and size, young pigs can be comfortable at 80 degrees and older pigs can be comfortable at 70 degrees – no matter how hot or cold it is outside. Farmers use a complex system of automatic curtains and fans to keep their pigs comfortable. Read more about my friend Heather’s pigs and their barns here. Do you remember when we had to cook pork to at least 160 degrees F before it was done? That meant we usually ended up with dry, tough pork chops. The USDA recommended that pork be cooked to 160 degrees because that was the temperature that killed the parasite Trichinella. This parasite lives in the soil and it used to commonly infect pigs. Trichinella would live in their muscles, and if people ate undercooked pork, they could get sick from the parasite. Now that pigs are kept inside, they are not exposed to Trichinella, which means neither are we! Now pork can safely be eaten after it is cooked to 145 degrees F – and this means juicier, more tender pork chops! Why Are Turkeys and Chickens Kept Inside? For the birds, it’s all about biosecurity and temperature control. I’ve already covered the Avian Flu issue, so I won’t harp on that anymore. So, let’s talk temperature control. Just like pigs and cows (and you and me) turkeys and chickens like to be comfortable. This means keeping their barns at the “right” temperature for each animal, and each stage of life. Chickens and turkeys both need to be kept warm when they are babies,92 degrees for day-old chicks, but they can be a little cooler as they get bigger. Poultry barns are fitted with thermostats, heaters, curtains, fans, and even misters to keep the animals comfortable. Everything is controlled automatically, but is still checked by the farmer at least twice a day – and usually more often! Read more about the details of managing the temperature in my friend Katie’s turkey barn here. No matter what kind of livestock farmers raise, the health and welfare of the animals is the farmer’s first priority. Barns are fitted with automatic thermostats that send alarms to smartphones and monitors inside the house to tell the farmer, and the rest of the family, if something goes wrong. Modern barns have dedicated generators to keep the ventilation system working, even if the farmhouse doesn’t! Farmers invest a lot of time, energy, and yes money, on their animals. They depend on these animals to provide for their family, and do everything in their power to keep their animals protected and healthy. How Do I Know There Are No Antibiotics In My Food? Excellent post with tons of info! I know very little about keeping cows but I had often wondered why dairy cows were kept inside while beef cows were usually out in pastures. Thanks for sharing on Homestead Blog Hop!